Valedictorian Allorah Johnson gave her remarks and encouragements to her fellow graduating rebels on Saturday, thanking her family, friends, and teachers for helping the class achieve their goals. 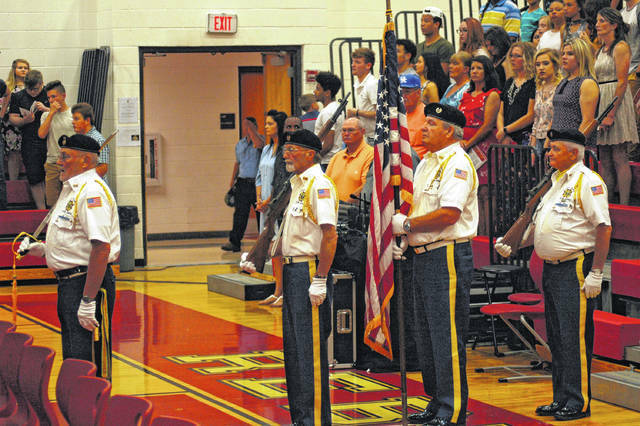 Gallia County VFW post #4464 has served South Gallia as honor guard for the flag each year at graduation, a tradition in the making. The graduating class was glad for the warm and sunny weather, as they made their way outside after the ceremony to toss their caps high. 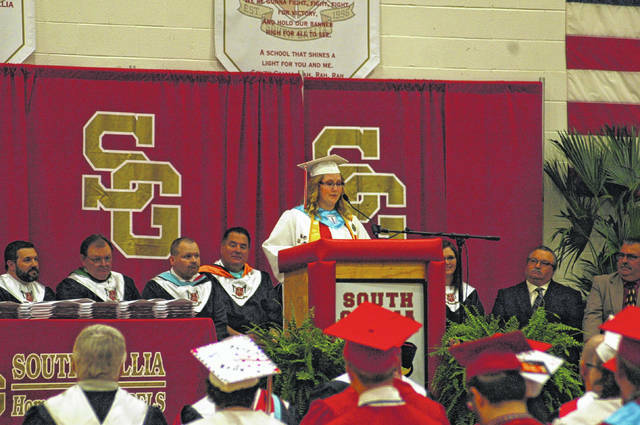 MERCERVILLE — South Gallia High School held its official 2018 commencement proceedings this past Saturday and this year marked the graduation of 51 seniors. 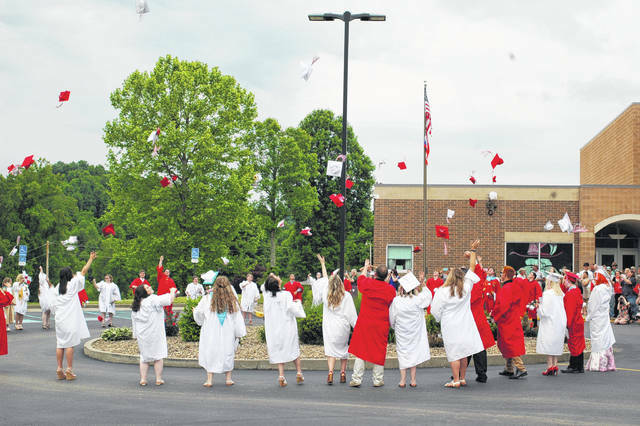 The ceremony followed standard order for high school graduation with remarks from the District Superintendent Jude Meyers and School Principal Bray Shamblin. The morning was opened with the posting of the colors by the VFW post #4464 of Gallipolis, who has attended and served as the honor guard for several years at South Gallia. Meyers gave this advice to the graduating Rebels. “All you have to do is look around the gym right now and see how many people are here, there is a lot of love in this gym today, and they’re here to honor you. The one thing I would ask you to do, there is somebody in this gym that has helped changed your life, take the time today to find somebody who helped you get to where you are today and thank them. Because I think we all know we don’t go through life by ourselves,” said Meyers. After the students were in and seated, the flags posted, and remarks from the administration given, the salutatorian and valedictorian gave their speeches. Both sought to thank those near to them – teachers, friends, parents, mentors, everyone who has helped shape who they are and helped them achieve the goals they met throughout high school. Salutatorian Destiny Johnson had this to say to her fellow graduates. “Whether you go to college or into the armed forces, I know you will do great things in life. The one thing I would like for all of you to keep in mind as you continue on, there is no such thing as failure. Failure is just learning to move in a new direction,” said Destiny. The commencement ended with a Rebel tradition of the entire class exiting the building to the roundabout and tossing their caps into the air. The following is a list of 51 seniors having completed the necessary requirements for graduation at South Gallia High School. The class earned scholarship funds towards college in excess of $300,000 as well as numerous awards. Austin Dale Ashworth, Carrie Marie Berry, Dakota Lane Bettis, Alexander Nicholas Blake, Colton Marshall Paul Bowers, Lucas Scott Bremner, Aaron Tyler Bryan, Brittany Renee Call, Brooke Morgan Campbell, Michal Anthony Cochran, Cameron Jayde Cooper, Eric Joseph Daines, Andrew Lee Dickenson, Haley Nicole Drenner, Erin Alana Evans, Zachary Tyler Ferguson, Brooklin Dawn Hammond, Curtis Alan Haner, Roby Monrow Harrison, Piccola Mae Hipsher, Olivia Mae Hornsby, Aaliyah Leshae Stefan Howell, Keirsten Nichole Howell, Destiny Cheyann Johnson, Jeremy Reid Johnson, Nicholas Taylor Johnston, Wade Anthony Luther, Aaron Russell Lyon, Breanna Rose Montgomery, Zane Matthew Moore, Robyn Paige Nance, Allorah Lea O’Dell, Chayce Hunter Pearson, Jade Renee Rankin, Hannah Brooke Roach, Shaylee Joy Pearl Rose, Kaila Marie Rupe, Brandon Gene Rutt, Fred Stephen Sanders III, Riley Marie Sanders, Hannah Morgan Shafer, Ivy Leigh Sheets, Hunter Randolph Slone, Austin Chase Stapleton, Alexandria Brooke Sweeney, Mendy Lynn Swords, Mackenzie Rae Turnmire, Janette Nicole Vickers, Parker Dane Watson, Troy Wayne Watson, Alexis Dawn Wothe.